The Pickens County Council will elect a new chairperson on Monday January 7, 2013 at 6:30PM. 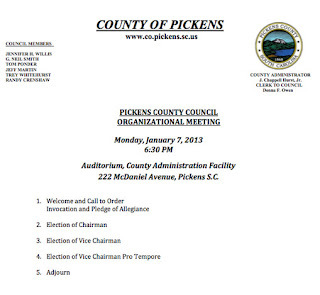 The meeting is to be held in Council Chambers at the auditorium in the County Administration building located at 222 McDaniel Ave, Pickens SC 29671. Easley Council woman Jennifer Willis served as the 2012 Chair. Do I Look Fat With This iPad?